You've probably heard this story before, the one about how Eagles quarterback Nick Foles nearly retired from football after the 2015 NFL season. Ultimately, he was convinced to return, and two years later, the majority of which was spent on the bench, he's now a Super Bowl MVP – and a legend in Philadelphia. When Carson Wentz tore his ACL in Week 14, the hopes of this rabid fanbase were heaped on the 29-year-old's shoulders. But by the time January arrived, Foles looked more like the guy we saw during the team's last postseason run, not the guy we saw in St. Louis the season before he considered retiring. Unlike in that 2014 wild-card loss to the Saints, however, the underdog Eagles just kept winning. And Foles, well, he just kept getting better, finishing the 2018 playoffs with a 115.7 passer rating (6 TD, 1 INT, 323 yards/game, 72.6 comp. pct.). In Sunday night's Super Bowl win, Foles threw for 373 yards and three touchdowns (and added another receiving touchdown to become the first player in Super Bowl history with a passing TD and a receiving TD in the same game). Few on the outside, no matter how optimistic, envisioned Foles playing this well after being forced into action so late in the season. But the former third-round pick wasn't worried. "I'm not surprised [by my performance]," Foles said Monday. "Everyone wants to point out one individual – and I'm fortunate to be MVP of this game – but as you've seen this year, we've had so many MVPs throughout the course of this season, different guys stepping up... I'm fortunate to be a part of a great team, great players, great coaching staff. And I think the last couple weeks, it's been kind of a team thing. We kept working, kept game planning. I kept talking to Doug [Pederson] about what I liked and he and the rest of the coaching staff kept building that around what we were [already] doing. "It's just a reflection of the execution on the field and playing for one another, just like we have been all year. So, it wasn't necessarily me, it was everyone around me that did an amazing job and we were successful. And now we're world champions." That's a mantra that Foles used throughout the playoffs. But when it comes to his own personal journey, the one that started long before he was drafted by the Eagles, Foles had a slightly different message for those listening. “The big thing is don’t be afraid to fail,” said Foles. “In our society today, with Instagram, Twitter, it’s a highlight reel. It’s all the good things. When you look at it, you think, wow, when you have a rough day you’re life isn’t as good as that, you’re failing. “Failure is a part of life – that’s the part of building character and growing. Without failure who would you be? I wouldn’t be up here if I hadn’t fallen thousands of times, made mistakes. We all are human, we all have weaknesses. I think throughout this, just being able to share that and be transparent, I know when I listen to peoples speak, and they share their weaknesses, I listen because I can resonate." I’m not perfect; I'm not Superman. I might be in the NFL, we might’ve just won the Super Bowl, but, hey, we still have daily mistakes. For Foles, the importance of this perseverance was learned at a young age, although he wouldn't fully understand it until he gained some more perspective on life. That came from watching his father, Larry, work long hours trying to make it in the restaurant business while also starting a family. Following the win at Super Bowl LII, Foles and his dad shared an emotional embrace on the field. And on Monday, the Eagles quarterback talked about what that moment meant to him. "My dad's always been one of my heroes, him and my mom. Just to embrace him – we didn't have the easiest life growing up. And for him and my mom to give me an opportunity to play this game, to provide for us as kids, to watch him go through adversity throughout his entire life and overcome it – you know, he didn't even graduate high school. And he's been very successful in his career path and I got to watch him as a young kid come home at midnight, smelling like a kitchen because he was working in a kitchen. Trying to get into the restaurant business isn't easy. Trying to get it up, he lost everything. "But to watch him as a kid just continue to give me an opportunity to play and never really realize it until I got older how much he worked, how much him and my mom sacrificed for me and my two younger sisters. To share that embrace, to share those emotions, that's just something you cherish forever. So happy that – I know that his emotions are crazy, cause he lives or dies by every play I play, probably more than I do. I was pretty relaxed; I know he was a little stressed. But it was a really special moment." 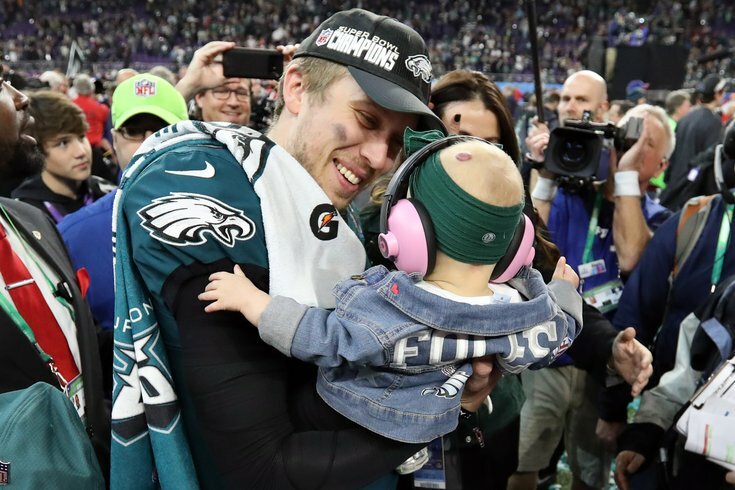 That special moment, however, wouldn't have been possible had it not been for the lessons Larry Foles taught his son through his own example. And even though Foles has now reached the pinnacle of the football world, he's not about to change. “I’m not perfect, I'm not Superman,” he added. “I might be in the NFL, we might’ve just won the Super Bowl, but, hey, we still have daily mistakes. I still have daily struggles. But that’s where my faith comes in, that’s where my family comes in. And I think when you look at a struggle in your life just know that's just an opportunity for your character to grow.